Heat oven to 425°F. Spray 8-inch square (2-quart) glass baking dish with cooking spray. In baking dish, stir sauce mix (from potato mix box), ranch dressing mix, boiling water and butter with whisk just until butter melts. Stir in milk, half-and-half and potatoes (from potato mix box). Bake 15 minutes; stir. 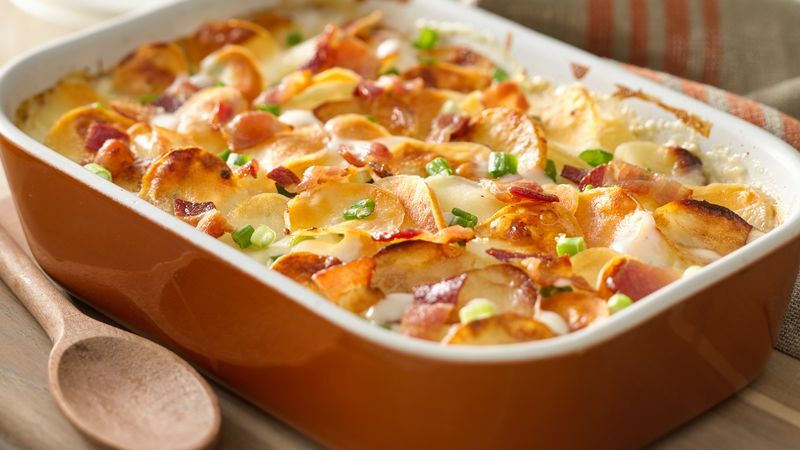 Bake 15 to 20 minutes longer or until top is golden brown and potatoes are tender. Stir in sour cream; top with bacon and green onions. You can purchase bacon bits and use in place of cooked, crumbled bacon. Ranch salad dressing & seasoning mix is different from ranch dip mix. Look for ranch salad dressing & seasoning mix.